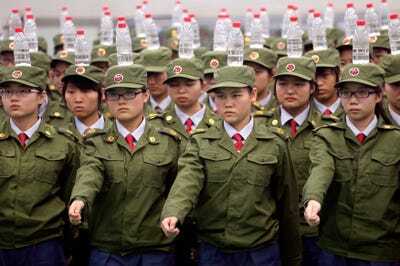 REUTERS/StringerStudents in military uniforms balance bottles of water on their heads as they practice goose-stepping marching during a military training session at a college in Zhengzhou, Henan province September 17, 2014. SPARKLY, spotted or Hello Kitty: every colour, theme, shape and size of frame is available at Eyeglass City in Beijing, a four-storey mall crammed only with spectacle shops. Within half an hour a pair of prescription eyeglasses is ready. 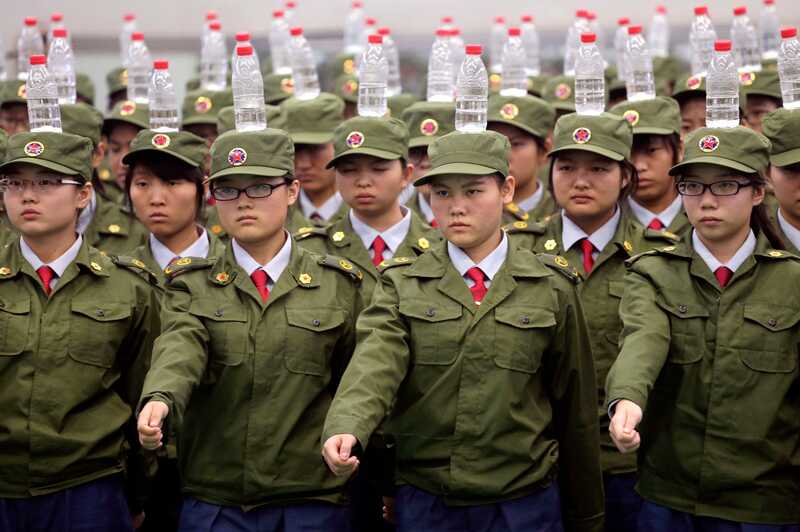 That is impressive, but then the number of Chinese wearing glasses is rising. Most new adoptees are children. In 1970 fewer than a third of 16- to 18-year-olds were deemed to be short-sighted (meaning that distant objects are blurred). Now nearly four-fifths are, and even more in some urban areas. A fifth of these have “high” myopia, that is, anything beyond 16 centimetres (just over six inches) is unclear. The fastest increase is among primary school children, over 40% of whom are short-sighted, double the rate in 2000. That compares with less than 10% of this age group in America or Germany. The incidence of myopia is high across East Asia, afflicting 80-90% of urban 18-year-olds in Singapore, South Korea and Taiwan. The problem is social rather than genetic. A 2012 study of 15,000 children in the Beijing area found that poor sight was significantly associated with more time spent studying, reading or using electronic devices, along with less time spent outdoors. These habits were more frequently found in higher-income families, says Guo Yin of Beijing Tongren Hospital. That is, those more likely to make their children study intensively. Across East Asia, worsening eyesight has taken place alongside a rise in incomes and educational standards. The biggest factor in short-sightedness is a lack of time spent outdoors. Exposure to daylight helps the retina to release a chemical that slows down an increase in the eye’s axial length, which is what most often causes myopia. A combination of not being outdoors and doing lots of work focusing up close (like writing characters or reading) worsens the problem. But if a child has enough time in the open, they can study all they like and their eyesight should not suffer, says Ian Morgan of Australian National University. Yet China and many other East Asian countries do not prize time outdoors. At the age of six, children in China and Australia have similar rates of myopia. Once they start school, Chinese children spend about an hour a day outside, compared with three or four hours for Australian ones. Schoolchildren in China are often made to take a nap after lunch rather than play outside; they then go home to do far more homework than anywhere outside East Asia. The older children in China are, the more they stay indoors – and not because of the country’s notorious pollution. Since poor sight is associated with higher incomes and more schooling, it is less prevalent in rural areas of China. In the countryside, a third of primary-school students are myopic, compared with nearly half of urban children, according to the health ministry. But eyesight problems there are somewhat different. Stanford University’s Rural Education Action Programme found that one in six rural children with poor sight do not wear glasses – thanks to a combination of cost, poor eye care in schools and a mistaken belief that wearing glasses weakens eyes further. When Stanford gave thousands of students free glasses, it found being able to see clearly had a higher impact on educational attainment than improving nutrition or the quality of teaching, says the programme’s co-director, Scott Rozelle. Another study reported that giving students free glasses improved test scores by the equivalent of nearly a year’s extra education. Daylight and free glasses are both cheap remedies for a growing national problem. All that is required now is a bit of vision.